Excitement was high as we drove the isolated back roads through Idaho to Craters of the Moon National Monument and Preserve. Partly because we had been driving for eight hours from Montana. We were a little more than halfway into a 5500 mile road trip that had included Theodore Roosevelt National Park and Glacier National Park. Mainly we were just excited to see the Park. Craters had been a National Park unit goal for us awhile. We were also hoping to score a campsite at the unique park campground that lies in the middle of a lava field. It wasn’t high season in July but since we had never been there before, we didn’t know what to expect. Arriving just before the summer sunset, the black lava landscape was striking against the glowing sun. It was unlike anything we’d ever seen and made us feel like we were walking on the moon or another planet. In fact, the landscape is so similar to the moon, the Apollo 14 astronauts visited Craters before their lunar landing. The park’s isolation only adds to that out of this otherworldly feeling. Established as a Monument in 1924, Craters has been extended a couple of times, most recently in 2002. The Monument is about a three hour drive from Boise in the west and Jackson, Wyoming, in the east. It’s definitely worth taking a small detour off the interstate. It’s easy to get to and should be included on your next Western road trip. 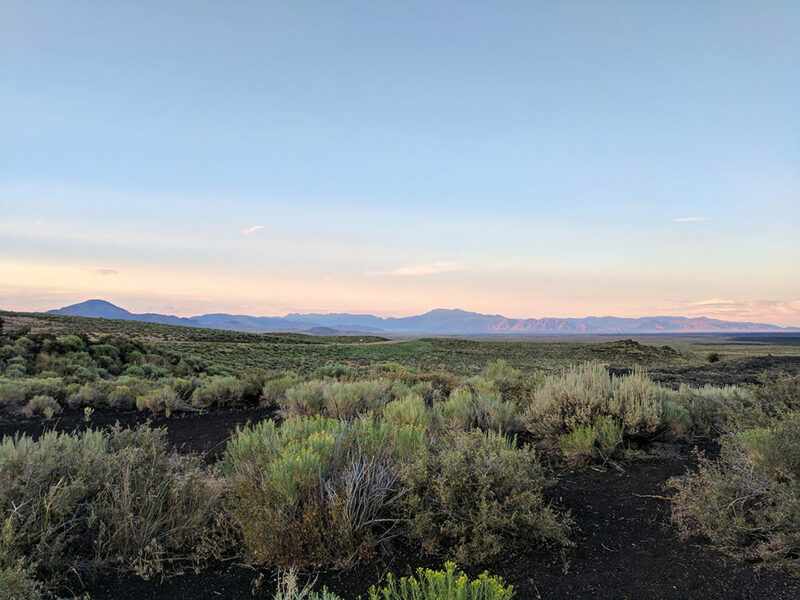 Here’s my tips for visiting and where to stay in Craters of the Moon. Located in the Southern part of Idaho, Craters only has one entrance off of US Hwy 20/26/93. The Visitor Center is open from 8 am to 6 pm in the Summer, and 8 am to 4:30 pm in low season. Closed on Christmas, Thanksgiving and New Year’s Day. However, the Park is open 24 hours a day, 365 days a year. During the winter the Park road maybe impassable because of snow. Entrance fee is $20 per car and $15 per motorcycle unless you have an annual pass. There is no charge during the winter to drive the loop road. Credit cards are accepted. The nearest town, 18 miles to the east, is Arco, ID. Which in itself is pretty interesting and quirky. It’s the first town ever to be lit by electricity generated by nuclear energy. Craters sits at an altitude of 5,900 ft. and can experience weather extremes thru out the year. We visited in July, which probably isn’t the best time to visit because of the heat. However, it was perfect at night. We slept really good and we left the fly off our tent to get a view of the moon and stars. Normally the dark skies there make for a view of the milky way but the moon was full when we were there. With no camp store in the park, the closest place to purchase food or groceries is Arco. There’s a few restaurants in town that were intriguing, including a drive in and a place called Mello-Dee Club & Steakhouse. Both were closed at the time we left on Sunday. Mountain Man Trading Post promised biscuits n gravy. Tough for a Southerner to pass up but they were also closed. We ended up eating at Pickle’s Place the morning we left and it was delicious, made from scratch food, with real not frozen hash browns. That’s always a plus! It was also full of locals which is a good sign. 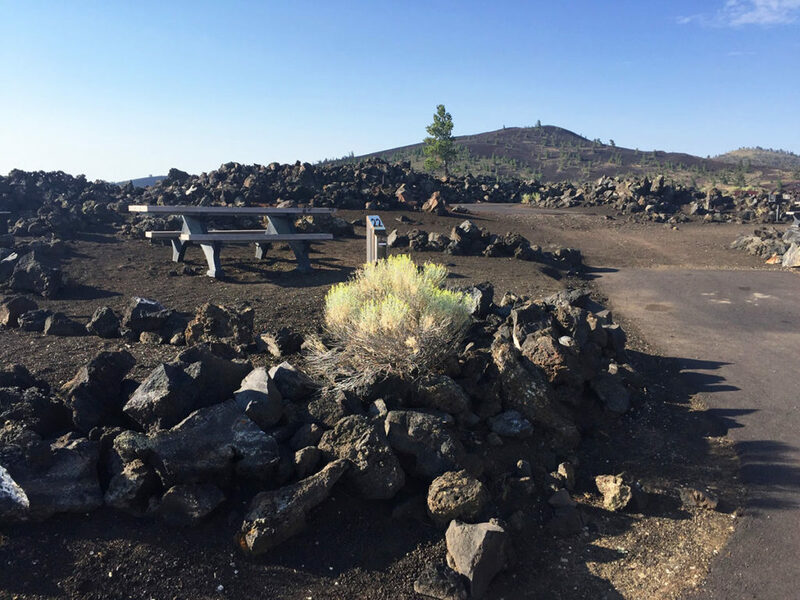 There are 42 sites in the Lava Flow campground. It’s first come first serve, meaning there are no advance reservations. It’s open mid April through November depending on weather. The fee is $15 unless they have already turned off the water, then it’s only $8. There’s an automated machine that allows you to pay with a credit card. No cash or checks accepted. Grills (charcoal only, no wood), picnic tables, bathrooms and water (in season) are available. Some of the sites are handicap accessible. There are no showers, hook-ups or dump stations. RV’s can be accommodated at a limited number of sites. The sites lie among the lava beds and rock and have really good views of the park and area. By the time we arrived at the campground, it was almost full. We were able to get site 22, in the middle of the park, with views of the beautiful sunset. Group camping and wilderness/backcountry camping is also available. See the NPS website for more info. Arco has a couple of other camping options including a KOA that looked really nice. At just 19 miles from the park, its still close enough to stay there and explore the park easily. Mountain View RV Park and Restaurant is also in that same area. Both of these options have showers and other amenities. When I was doing research for this portion of our road trip, I ran across a mention of Honey’s. Apparently it’s some vacant land that the owner allows people to camp on. There is now a website. It looks interesting and if I’m in the area again, I will definitely check it out. Start with Craters seven mile loop road that has stops and trails to the different features. You can pick up a map at the Visitor’s Center or the NPS has a self guided tour with the stops on their website. The Inferno Cone was one of our favorite trails. It’s very steep but once you are at the top you have amazing panoramic views of the surrounding area. Also surprising is the greenery and a few trees. Snow Cone trail is another favorite that leads to splatter cones. These are areas that formed when blobs of molten lava were tossed into the air at the end of an eruption. The matter then formed these miniature volcanoes. You can hike up and around the cones and then look down into the center. You can also walk thru Devil’s Orchard in cinder beds and see the Triple Twisted Tree that helps scientists date the lava. One of the other features of the park is the lava tubes and caves. They require a free permit that can be picked up at the Visitor’s Center. You’ll need flashlights and the NPS also recommends hats and long pants to protect you from the sharp rocks. This is one of the things that we didn’t get to do while we were there but I’ve read that it’s very unique. There is also some backcountry trails that require a permit. Access is available to a portion of the Oregon trail from the North side of the park too. We loved Craters and would love to go back in the winter to experience it in the snow. Even though there’s not a lot to do in the immediate area, you should definitely add this park to your road trip plans. If for nothing else but for the unique camping and the beauty of Southern Idaho. If your enjoy this article, pin it here!